Built for anyone who wants additional storage capacity without great effort, this Dell 1 TB hard drive is high-capacity and dependable. This Dell 1 TB hard drive is the perfect device when you need the peace of mind of additional data storage. Do-it-yourselfers and system builders love the speed and quality of the Dell 7KXJR. This internal 3.5-inch hard drive enables you to preserve your whole family's office applications, video downloads, and digital music collection with room to spare with its huge storage capacity. The Dell 7KXJR is very reliable, featuring sturdy construction, which means you are able to reap the benefits of long-lasting flawless performance without problems from mechanical breakdowns or data errors. Access large documents, photos, and data files without the wait using the blazing 7200 RPM spindle speed included with this internal 3.5-inch hard drive. 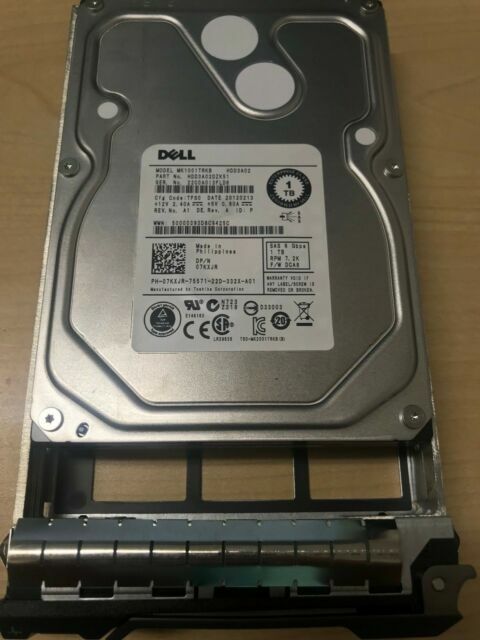 You can reach super-fast data access speeds while loading software, copying files, or backup up your system because this Dell 1 TB hard drive includes a 16 MB RAM buffer. Furthermore, the Dell 7KXJR is a breeze to install, so you can simply make the most of it in devices supporting the SAS interface.